For comparability with other cities around the world, Greater Edmonton has been defined as embracing the entire City of Edmonton as well as St. Albert, Fort Saskatchewan, Sherwood Park, Beaumont and Leduc together with estates and settlements near these centres that are effectively outlying commuter communities. Of the names of the 508 areas, communities and neighbourhoods that have been identified to date in Greater Edmonton, 135 (26.6%) can be found as place names in Scotland or are based on Scottish family names. Of course, some of the names are used in other parts of the British Isles as well, but as many as 76 of them (15.0%) are unique to Scotland or are readily identifiable with places in Scotland that are based on the same names. Argyll (Argyll & Bute). The name of this neighbourhood honours John Douglas Sutherland Campbell (the Marquess of Lorne and the 9th Duke of Argyll) who was Governor General of Canada between 1878 and 1883 and a son-in-law of Queen Victoria. 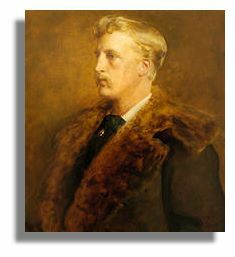 Picture of 9th Duke of Argyll via Wikipedia. Armstrong Industrial - Armstrong is a Lowland Scottish family name, the Edmonton neighbourhood being named in recognition of Ontario-born George S. Armstrong, mayor from 1911 to 1912 and postmaster in 1913 (Naming Edmonton, 2004, p. 11). Bannerman - the Bannerman's are a sept of the Forbes clan. Hugh Bannerman, after whom this neighbourhood is named, was an early Edmonton businessman (Naming Edmonton, 2004, p. 15). Bisset - there is a Bisset Moss, Bisset's Hill and Bissethill in Aberdeenshire. This neighbourhood was named for Judge Athelstan Bisset, a WWI veteran and alderman (Naming Edmonton, 2004, p. 26). 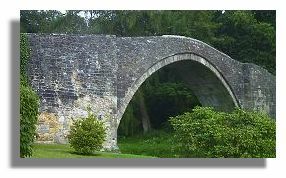 Bonnie Doon (Aberdeenshire, spelt Bonnie Doune; there is also a Doon in East Lothian, Dumfries & Galloway and South Ayrshire - the Brig o' Doon (seen here) spawned the archetypal Hollywood film "Brigadoon"). The Edmonton neighbourhood takes its name from the home of Premier Alexander Rutherford, who had Scottish antecedents. An earlier name for the neighbourhood was, in fact, Rutherford. Braeside (Aberdeen City and Inverclyde). No information has been found on the origin of the name of this neighbourhood in St. Albert. Brander Gardens (Brander in the Scottish Borders; also the Pass of Brander between Lochawe and Inverawe in Argyll & Bute). The neighbourhood was named in honour of George Brander, who came to Edmonton from Nova Scotia in 1921 and established a peony garden in the Bonnie Doon area (Naming Edmonton, 2004, p. 34). Breckenridge Greens - there is a Brecken Shank in Dumfries & Galloway but places beginning with Brecken are more frequently found in North Yorkshire, England. The Edmonton neighbourhood was actually named for a pioneer dairy farmer, Gavin Breckenridge Sr, who was born in Ontario (Naming Edmonton, 2004, pp. 33 and 35). Breckenridge is a Scottish family name from Lanarkshire and Ayrshire, which increases the likelihood that the name of this neighbourhood may have a Scottish connection. Black (1996), the authority on Scottish family names, states that Brackenridge and its variants Breckenridge and Brekonridge are confined mainly to Lanarkshire as the name is derived from the lands of Brackenrig in the barony of Avondale in the county of Ayr. Caledonia - Caledonia is the Latin name for Scotland and was loosely used by the Romans to describe any part of the country north of the Antonine Wall, especially the Scottish Highlands. This small neighbourhood in SE Leduc probably takes its name from either Caledonia Drive or Caledonia Park. Calgary Trail North and Calgary Trail South - derived ultimately from Calgary Castle on the Isle of Mull in Argyll & Bute but referring in this instance to Calgary, Alberta. The Calgary Trail was the northern terminus of the old Calgary-Edmonton cart trail. Cameron Heights - there are places called Cameron in Fife, North Lanarkshire and West Dunbartonshire. Cameron is an ancient Scottish family name, the origin of which has been speculated to mean either 'curved hill-brow' (Old Welsh) or, more probably, 'crooked or wry nose' (Gaelic). The Edmonton neighbourhood was named for John Cameron, "a pioneer citizen and businessman who lived at the north end of the road that now bears his name. He arrived in Edmonton from Winnipeg in 1881." (Naming Edmonton, 2004, p. 47). Campbell and Campbell Business Park - the Campbells were the most powerful of all the Scottish clans. The names of these St. Albert neighbourhoods honour Alex Campbell, a traffic manager in the early 20th century for the Edmonton, Dunvegan and British Columbia Railway (now CNR) line between Edmonton and St. Albert (Naming Edmonton, 2004, pp. 45-46). 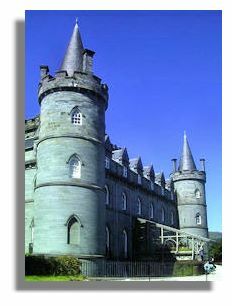 The graphic here shows Inveraray Castle in Argyll, seat of the clan Campbell chieftain. Campbelltown Heights - there is a small town in Argyll & Bute called Campbeltown. This neighbourhood was no doubt named for John Hook Campbell, one of the developers in the early 1950s of a hamlet to house employees of industries in the east of Edmonton. The name 'Campbelltown' was originally proposed for the community now known as Sherwood Park but was disallowed by Canada Post since there were already several Canadian communities with similar names (Wikipedia article on Sherwood Park, retrieved June 2008). Central McDougall - the MacDougalls are a Scottish clan descended from the MacDonalds. The Edmonton neighbourhood honours John Alexander McDougall (1879-1928), businessman and twice elected mayor (Naming Edmonton, 2004, pp. 52-53). CPR Irvine - there is an Irvine in North Ayrshire. Nancy Irvine owned land in this part of the city in the early 1900s, part of which she sold to Canadian Pacific Railway (CPR). Irvine is a Scottish family name. Crawford Plains - there are places in Scotland called Crawford, Crawforddyke and Crawfordjohn (South Lanarkshire), Crawfordton, Crawfordton Burn and Crawfordton Hill (Dumfries & Galloway), Crawford Hill (East Ayrshire) and Crawfordston (South Ayrshire). There are also a few places in northern England and Northern Ireland with Crawford as part of the name, probably having been taken there by Scottish settlers. Crawford (sometimes spelt Crauford) is a Lowland Scottish name. The name goes back to at least the 13th century. William Wallace's mother is believed to have been the daughter of Sir Hugh Crawford, Sheriff of Ayr. The Edmonton neighbourhood honours a local politician, Neil Crawford (1931-1992). 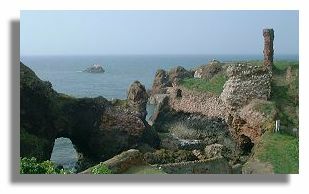 Dunbar (East Lothian - Dunbar Castle is shown in the illustration). One presumes that the name of this community in Strathcona County is a reference to the town in Scotland, though Dunbar is also a Scottish family name. Dunvegan Yards (Dunvegan, Dunvegan Castle and Dunvegan Head on the Isle of Skye). This area was so named because it was a railway stop on the Edmonton, Dunvegan and British Columbia Railway line. Dunvegan itself was a Hudson's Bay Company fort on the Peace River and was named for the place on the Isle of Skye. Dunvegan is no longer an official neighbourhood name (the area now forms part of Athlone) but local residents still refer to part of the neighbourhood as Dunvegan. Ellerslie (a house near Kilmarnock, East Ayrshire, also Ellerslie House on the Isle of Man; Elderslie in Renfrewshire has appeared as Ellerslie on earlier Scottish maps). Historians in Edmonton speculate that the name of this neighbourhood may commemorate either Ellerslie/Elderslie House (believed to be the birthplace of William Wallace, the medieval Scots patriot) or a character in one of Sir Walter Scott's novels. Ellerslie and Elderslie are interchangeable names, both meaning 'the field of the elder trees' in Old English. Edmiston Industrial - although not immediately evident from the name, Edmiston Industrial has a Scottish connection. This industrial neighbourhood commemorates William S. Edmiston, the Scots-born architect who designed Edmonton's first post office, and who was mayor in 1898 and 1899 (Naming Edmonton, 2004, p. 86). Edmiston/Edmeston is a Scottish surname but is not all that commonly found in Scotland today. Falconer Heights - there is a Falconer Museum in Moray. The Edmonton neighbourhood was named after James F. Falconer, a city councillor during the 1950s and one of the founding members of the (Edmonton) Names Advisory Committee (Naming Edmonton, 2004, p. 98). Falconer is considered to be an English family name, though it is said to have originated in Angus, Scotland. According to Black (1996), this is an occupational name, derived from the office of 'falconer'. In Scotland the name was first recorded in the early 13th century. Fleming Park - Fleming is definitely a Scottish family name, and there are several places in Scotland containing the name (e.g., Flemington) but Fleming Park as a place name in the British Isles occurs only in Eastleigh, Hampshire. No information has been found on the origin of the name of this suburban estate in Parkland County. Fraser - there is a Fraserburgh in Aberdeenshire and a Fraserford in Dumfries & Galloway, both based on this Scottish surname. This neighbourhood commemorates John Fraser, the son of a Hudson's Bay Company officer (Naming Edmonton, 2004, p. 106). The tartan shown here is Fraser (Red). Fulton Place (Fulton in Dumfries & Galloway). The neighbourhood recalls the Fulton family, pioneers from Nova Scotia whose homestead in the area was named Burnside, recalling the Scottish word for a creek (Naming Edmonton, 2004, p. 106). Gainer Industrial - there is a Gainerhill in South Lanarkshire, between Strathaven and Dungavel. This neighbourhood honours John Gainer, a pioneer businessman in the meat-packing industry (Naming Edmonton, 2004, p. 111). Gainer is also an Irish family name, one of the many variants of Gaynor. Glen Allen - Allen, Allan and Alan are Scottish surnames derived from two different sources: Gaelic and Breton. According to Black (1996), the old Gaelic name Ailéne or Ailin comes from the word 'ail', meaning 'rock'. The Breton source is from the Norman French Alan. 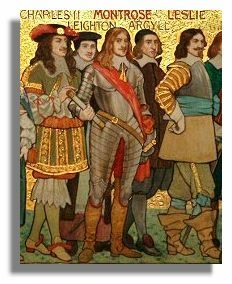 Alan or Alain Fergant was one of the leading Bretons who accompanied William the Conqueror to England. The oldest form of the name on record is from 10th century Breton coins. Glengarry (Aberdeenshire and Highland). The Edmonton neighbourhood was named for a glen in Inverness-shire, in the Scottish Highlands (Naming Edmonton, 2004, p. 116). Glenora, North Glenora and West Glenora - there is a 4-star 'eco-friendly' guesthouse and hotel in Edinburgh called Glenora. Glenwood (Aberdeenshire). This may simply be a made-up name with a Scottish flavour. The entry on Glenwood in Naming Edmonton (2004) reads as follows: "Glenwood is likely a descriptive name as 'glen' means a valley. It has been named since approximately 1907." (p. 117). Graham Heights - there are many places in central and southern Scotland beginning with Graham from the surname; also a few just over the border in Northumberland and Cumbria. Graham is a Scottish family name, the clan being descendants of an Anglo-Norman family that settled in Scotland (particularly the border areas) in the early part of the 12th century. As noted by Scarlett (1975, p. 69), "in 1606 an entire sept of Cumberland Grahams was "transported" to Roscommon in Ireland for being troublesome on the Border." The most famous bearer of the name was the brilliant soldier James Graham, the 1st Marquess of Montrose (1612-50). That's his statue in the graphic here. No information has been found on the origin of the name of this Sherwood Park neighbourhood. Grandview Heights (Grandview in the Shetland Islands). Grandview was a popular name for neighbourhoods as well as streets in all English-speaking countries during the nineteenth and early twentieth centuries. In most instances, the name was applied to localities that literally afforded a wide panorama. In all probability, this was also the reason for naming the Edmonton neighbourhood as well as the locality in Scotland. Groat Estates - the portion of the neighbourhood of Westmount known as Groat Estates honours Malcolm Groat, a Scottish-born carriage maker and farmer who arrived in the area during the 1860s as an employee of the Hudson's Bay Company (Naming Edmonton, 2004, pp. 125-126). Hazeldean (South Lanarkshire). According to Naming Edmonton (2004), the name of this neighbourhood may be purely descriptive. "Two species of hazelnuts, the American hazelnut and beaked hazelnut, are native to the area." (p. 137). One nevertheless wonders whether the place in Lanarkshire influenced the choice, or spelling, of the name of this neighbourhood. Henderson Estate - there is a Henderson's Rock in Argyll & Bute, presumably a reference to an individual bearing the Scottish family name of Henderson. The name has also travelled to England, e.g., Henderson's House in County Durham. 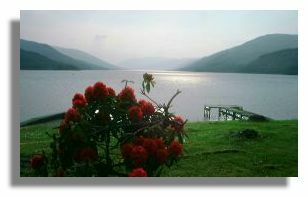 According to Scarlett (1975), the Henderson clan can trace its ancestry to two sources: the Henrysons/Henrisons from Dumfiesshire in the border region, and Clan MacEanruig, or MacKendrick, who anglicised their name as Henderson, 'son of Henry' and who held lands near Glencoe in the Highlands. The neighbourhood was named for Thomas Henderson (ancestry not reported), a farmer in the late 19th and early 20th centuries (Naming Edmonton, 2004, pp. 139-140). Highlands (possibly recalling the Highlands of Scotland). The neighbourhood was actually named as a result of a public contest. As pointed out in Naming Edmonton (2004), "the judges awarded the prize of $50 in gold to a 19-year-old law clerk, S. Loughlin, who suggested the name 'The Highlands', which is descriptive of its position on the banks above the North Saskatchewan River." (p. 146). The owner of the land at the time of the contest was J.A. McDougall. A Scottish connection therefore seems highly probable, even if only indirectly. 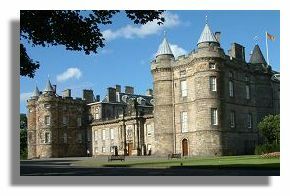 Holyrood (the district in the City of Edinburgh at the eastern end of the Royal Mile and in which the Palace of Holyroodhouse (seen here) and the new Scottish Parliament building are situated). This neighbourhood has undergone several name changes since the early 1900s, from Mount Pleasant and East Edmonton Gardens to Balmoral, with Holyrood being adopted in 1953 to avoid name duplication. Jamieson Place - there is a Jamieson Point in Dumfries & Galloway. Jamieson is a variant of the family name Jameson, which originated on the Isle of Bute. The Edmonton neighbourhood was named for Ontario-born Frederick Charles Jamieson (1875-1966), a prominent lawyer and politician who came to the Edmonton/Lacombe district in 1895. Jamieson was admitted to the bar of the North-West Territories in 1899 and went on to practise law with Premier A.C Rutherford (Naming Edmonton, 2004, p. 163). Kirkness (Orkney Islands and Shetland Islands, both spelt Kirk Ness). Like other neighbourhoods in this part of Edmonton, the name honours a pioneer. James Kirkness came to Canada from Scotland in 1864 with the Hudson's Bay Company (Naming Edmonton, 2004, p. 184). Lauderdale (Scottish Borders). The neighbourhood was named for pioneer farmers and bakers James Lauder and his son Tim, both of whom were born in Scotland and arrived in Edmonton in 1881 (Naming Edmonton, 2004, p. 193). Lymburn - although there is no known place in Scotland by this name, this neighbourhood has a Scottish connection since it honours John F. Lymburn who was born in Ayr. A law graduate from Glasgow University, he arrived in Edmonton in 1911, opened a legal practice and served as the Attorney General of Alberta between 1926 and 1935 (Naming Edmonton, 2004, p. 201). Lymburn/Lymburner (from the occupation of 'lime burner') is a Scottish family name but a relatively rare one. Macarthur Siding - the Macarthurs are an ancient branch of the clan Campbell. No information has been found on the origin of the name of this community in Sturgeon Municipal District, though J.D. McArthur, railway builder, seems very plausible (see McArthur Industrial below). MacEwan - a Scottish clan, the name is usually spelt MacEwen. MacEwan is one of Edmonton's newest neighbourhoods, and is named for the late Grant MacEwan (1902-2000), Lieutenant Governor of Alberta from 1966 to 1974 (Naming Edmonton, 2004, p. 204). McArthur Industrial - there is a promontory called McArthur's Head on the Isle of Islay in Argyll & Bute. This industrial neighbourhood was most probably named for J.D. McArthur (1854-1927), railway builder and president of the Edmonton, Dunvegan and British Columbia Railway (Naming Edmonton, 2004, p. 212). McCauley - a variant of MacAulay, a Scottish clan descended from two entirely separate sources, Gaelic and Norse. This neighbourhood honours Matthew McCauley (1850-1930) who was Edmonton's first mayor (Naming Edmonton, 2004, p. 213). McConachie - a sept of Clan Robertson. The neighbourhood honours George William Grant McConachie (1909-1965), bush pilot, founder of a number of airlines and champion of improved international air services to Canada (Naming Edmonton, 2004, p. 212). McIntyre Industrial - the Macintyre clan is believed to be an offshoot of the MacDonalds, McIntyre meaning 'son of the carpenter' in Gaelic. This industrial neighbourhood was named for Ontario-born Dr Wilbert McIntyre (1867-1909), medical practitioner and politician (Naming Edmonton, 2004, p. 212). McLeod - an ancient Scottish clan of Norse origin whose ancestral seat is Dunvegan Castle on the Isle of Skye. The neighbourhood recalls Murdoch McLeod (1844-1930) a pioneer settler who was born in Scotland and who worked initially for the Hudson's Bay Company (Naming Edmonton, 2004, p. 215). McQueen - a Scottish clan originating in the fifteenth century. This neighbourhood honours the Rev. David George McQueen (1854-1930) who came to Edmonton in 1887 to lead the Presbyterian congregation for the next 43 years (Naming Edmonton, 2004, p. 218). Montrose (Angus). The Edmonton neighbourhood honours the 1st Marquis of Montrose, a Covenanter who in 1638 pledged to defend the Presbyterian Kirk of Scotland against King Charles I who was attempting to impose Anglicanism on the Scottish people (Naming Edmonton, 2004, p. 224). North Point (Orkney Islands and Shetland Islands). No information has been found on the origin of the name of this locality in Sturgeon Municipal District. North Telford and South Telford - Telford is a Scottish family name, the most famous bearer of this name being the Scottish civil engineer Thomas Telford (1757-1834). There is a town called Telford in Shropshire, England, which was established as a New Town as recently as 1963, and which was named in honour of Thomas Telford who had been appointed Surveyor of Shropshire in 1786. According to the Wikipedia article retrieved in February 2007, the names of the two Leduc neighbourhoods recall Robert Taylor Telford (1860-1933), pioneer, businessman, politician and Leduc's first postmaster. Ogilvie Ridge - Ogilvie is a Scottish family name from the barony of Ogilvy, once a place name in Angus. James H. Ogilvie, after whom the Edmonton neighbourhood is named, was a WWI veteran, politician and lawyer, and was born in Nova Scotia (Naming Edmonton, 2004, p. 235). Oliver (Scottish Borders). Oliver is also considered to be a Scottish family name. The neighbourhood honours Frank Oliver (1853-1933), newspaperman and politician (Naming Edmonton, 2004, p. 237). Ramsay Heights - there is a Ramsay Ness in the Orkney Islands. This neighbourhood was named for Ontario-born Walter Ramsay (1870-1958), Edmonton's first florist and Chairman of the Edmonton School Board from 1912 to 1914 (Naming Edmonton, 2004, p. 263). Ritchie - a sept of the Mackintosh clan. This neighbourhood honours Robert Ritchie (1848-1932) who together with his brothers established the Edmonton Milling Company, and was mayor of the Town of Strathcona on two occasions (Naming Edmonton, 2004, p. 269). Roseburn Estates (Roseburn in the City of Edinburgh). No information has been found on the origin of the name of this Sherwood Park neighbourhood. Rossdale - this neighbourhood honours Scottish-born Donald Ross (1840-1915) who established Edmonton's first hotel (the Edmonton Hotel) and who was a founding member of the city's public school board (Naming Edmonton, 2004, p. 275). Rosslyn (Rosslyn Castle in Midlothian). 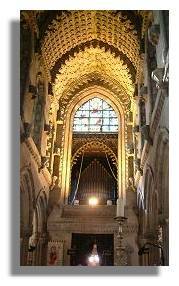 The reason for naming this Edmonton neighbourhood is uncertain, one possibility being that it recalls Rosslyn Chapel (pictured here) in Midlothian, founded in 1446 by St Clair (Naming Edmonton, 2004, pp. 275-276). Rutherford (Scottish Borders) also in County Durham, England. The name of this Edmonton neighbourhood commemorates Alexander Cameron Rutherford, Premier of Alberta in the early 1900s and the founder of the University of Alberta. Premier Rutherford was fond of naming his homes to recall his ancestral homeland. Bonnie Doon was named on that basis, as was Rutherford's second home, Achnacarry. Sconadale and Sconaglen Park Estates - Scona is a shortened form of Strathcona and arose when local residents of the Strathcona neighbourhood (see Strathcona below) started referring to Strathcona Road as Scona Road (a name which has now become official). Scot Haven - the name of this Sherwood Park neighbourhood could well have been coined to appeal to Scottish settlers, though Scot is also a personal name. Stewart Greens - there is a Stewarton in Argyll & Bute, Scottish Borders, East Ayrshire and Dumfries & Galloway plus numerous other places throughout Scotland and parts of England and Northern Ireland whose names are based on the Scottish surname of Stewart. The Stewarts/Stuarts are descended from a Breton, Alan Fitzflaald, the crown of Scotland being brought to his descendants by Walter (1293-1326), fifth Steward of Scotland, whose son became King Robert II. The last of the Royal Stewarts was Queen Anne (1665-1714). No information has been found on the origin of the name of this new (post-2004) neighbourhood, but it may well honour an early settler (neighbourhoods in the Lewis Farms area of western Edmonton are generally named after pioneers). Strathcona and Strathcona Industrial - these neighbourhoods commemorate Lord Strathcona (Donald Alexander Smith, born in Forres, Scotland in 1820), a pioneer of the Hudson's Bay Company and the Canadian Pacific Railway (Naming Edmonton, 2004, p. 295). Strathearn (Perth & Kinross - the illustration shows Loch Earn at the head of Strathearn). In Naming Edmonton (2004), it is stated that this neighbourhood "was probably named after His Royal Highness Arthur William Patrick Albert, 1st Duke of Connaught and Strathearn (1850-1942)." (p. 296). Strathmoor Industrial Park (a possibly corrupted spelling of Strathmore in Aberdeenshire, Angus, Argyll & Bute, Highland and Perth & Kinross). No information has been found on the origin of the name of this Sherwood Park neighbourhood. Summerside (City of Edinburgh, North Lanarkshire and Shetland Islands; also Summerside Knowe in Scottish Borders). Edmonton's Summerside was actually named for a city in the Canadian province of Prince Edward Island and is therefore only indirectly or possibly just coincidentally "Scottish." Winfield Heights - there is a Winfield in the Scottish Borders. No information has been found on the origin of the name of this Sherwood Park neighbourhood. As in other cities around the world, not all of the above place names are based directly on their namesakes in Scotland. The connection with Scotland may be more indirect in some instances, for example, based on a Scottish surname. This is clearly the case with place names in Edmonton, since most of them commemorate individuals whose family names are Scottish rather than actual places in Scotland. 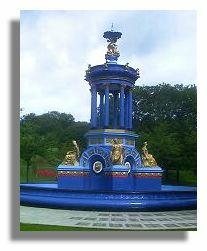 Alexandra Park (City of Glasgow - the fountain in the park is illustrated here) also in two English cities. This Leduc neighbourhood is more likely to have been named for Queen Alexandra, wife of Edward VII, rather than places in Scotland or England (which themselves were probably named for this queen). Bellevue (Dumfries & Galloway, Highland, Orkney Islands and Perth & Kinross) also in England, Ireland and Wales, sometimes spelt Belle Vue. It is quite probable, however, that the name of this Edmonton neighbourhood may simply have been coined from the French to mean 'beautiful view'. Belmont (Scottish Borders, Shetland Islands and South Ayrshire) also in England, Ireland and Wales. The origin of the name of this Edmonton neighbourhood has not been recorded. Belvedere (West Lothian) also in England and the famous Belvedere Palace in Vienna, Austria. Belvedere was a popular choice of name for localities during the eighteenth and nineteenth centuries. The Concise Oxford Dictionary defines a belvedere as a "raised turret to view scenery from" (a word formed from the Italian words for 'beautiful' and 'see'). Berry Hill (Aberdeenshire, East Lothian, Highland, North Ayrshire and Perth & Kinross) but found more frequently throughout England and is also found in Wales. No information has been found on the origin of the name of this community in Strathcona County. Boyle Street - As a place name in the British Isles, Boyle occurs only in Ireland (a town in County Roscommon). As a surname, however, Boyle is both Irish and Scottish, though their origins are quite distinct and the two families have a different coat of arms. Black (1996) states that the Scottish surname is thought by many to be the same as the Irish Boyle, but its origin is actually Norman, from Boyville or Beauville near Caen in Normandy. The Irish surname, on the other hand, is derived from the Gaelic, 'Baoghal', meaning 'peril', a name used by an early king in County Donegal. The Edmonton neighbourhood takes its name from Boyle Street, the former street designation for 103A Avenue, and is one of the oldest neighbourhoods in Edmonton. The street, in turn, was probably named after John R. Boyle (1870-1936), lawyer and politician, who was born in Ontario (Naming Edmonton, 2004, p. 32). The fact that Boyle was a member of the Presbyterian church increases the chances that his heritage was Scottish, or Scots-Irish, rather than native Irish. Bremner and Huff Bremner Estate Industrial - As a family name, Bremner is considered to be Scottish, English or German. Black (1996) says that in Scotland the old form of the name Bremner was Brabener, i.e. a native of Brabant in the Low Countries. Traders from there settled in Aberdeenshire and other places on the Scottish East Coast. The braboners or weavers were one of the nine recognised trades in Dundee. Huff, on the other hand, is an English family name. The Edmonton neighbourhood of Huff Bremner Estate Industrial perpetuates the names of two early landowners - Warren Huff and James C.C. Bremner (Naming Edmonton, 2004, p. 153). Brown Industrial - there are numerous places in both Scotland and England that appear to be based on the family name of Brown. The surname Brown is very common in both countries, with surveys in the 1970s suggesting that it is the second most common family name in Scotland (after Smith) and the third most common in England (after Smith and Jones). The Edmonton neighbourhood may have been named after Clifford W. Brown, a real-estate and financial agent who lived in Edmonton in the 1910s (Naming Edmonton, 2004, p. 36). Calder (minor rivers in Highland and Renfrewshire) also found in northern England, including the name of the well-known river in Lancashire. A local businessman and alderman, Hugh Alfred Calder, is commemorated rather than places in Britain (Naming Edmonton, 2004, p. 45). Hugh A. Calder (1873-1944) was born in Brigdewater, Nova Scotia. As a family name, Calder is considered to be more English than Scottish. Clarkdale Meadows - there is a Clark Fell in Dumfries & Galloway, Clark's Sike in the Scottish Borders, Clarkly Hill in Moray, Clarkston in East Renfrewshire and North Lanarkshire and Clarkton in Stirling. Clark occurs even more frequently in English place names. No explanation has been found for the origin of the name of this Sherwood Park neighbourhood. Davidson Creek - there is a Davidson's Mains in the City of Edinburgh, also Davidson's Burn and Davidson's Linn over the border in Northumberland. Davidson is also a surname frequently found in Scotland and northern England. 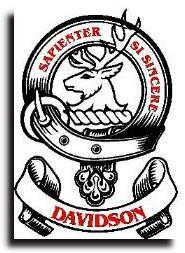 The Davidson family crest is shown here, with the Latin motto Sapienter si sincere - 'wisely if sincerely'. Evergreen (Moray) though Evergreen is also found as an element in several English place names and in Edmonton's case may be a purely descriptive name. Fairhaven West Subdivision (Fairhaven in North Ayrshire) also in Yorkshire, England. Glenview and Glenview Acres - there is a place in Argyll & Bute called Glenview. However, there is also a luxury hotel in County Wicklow, Ireland called Glenview, and other references to this name are also likely to be found in Ireland. Greenacres Estates (Greenacres in Scottish Borders) also in five English counties. Greenwood Estates (Greenwood in the Scottish Borders, Moray and South Lanarkshire) also in England and Ireland. High Park and High Park Industrial - there is a High Park in Argyll & Bute, East Ayrshire and South Ayrshire, but this name is found even more commonly in England. One wonders whether the name of this neighbourhood came from the well-known Toronto neighbourhood, whose etymology is not Scottish. Hunter Heights - Hunter occurs in many place names throughout Scotland. The list includes Aberdeenshire (Hunter's Hill and Lodge), Angus (Hunter's Path and Hunters Hill), Argyll & Bute (Hunter's Quay), Scottish Borders (Hunter Hill and Huntershall), Dumfries & Galloway (Hunter House, Hunter's Gate, Hunterheck), East Ayrshire (Hunter's Meadow, Hunterston), North Ayrshire (Hunterston, Hunterston House, Hunterston Sands), Perth & Kinross (Hunterhall) and South Lanarkshire (Hunterlees). Hunter is found even more commonly throughout England. Hunter Hill Estates (Hunter Hill in Scottish Borders) also in two places in northern England. Inglewood (Clackmannanshire) also in Cumbria and Berkshire, England. Inglewood is also the name of a well-known suburb of Los Angeles. There appear to be two communities with this name, one in the City of Edmonton and the other in the City of St. Albert. The City of Edmonton neighbourhood has a Scottish connection through the original landowner, John A Norris, who was born in John O'Groat, Caithness in the early 19th century. Norris came to Fort Edmonton in 1849 as a Hudson's Bay Company employee, later opening his own grocery and hardware business (Naming Edmonton, 2004, p. 156). John A. Norris Park is situated in the Inglewood neighbourhood. There is no firm evidence, however, that the name Inglewood itself had a Scottish (as opposed to an English or American) origin. Kennedale Industrial - this neighbourhood was apparently named by a real-estate developer in the early 1900s, a Mr. H.P. Kennedy, after himself (Naming Edmonton, 2004, p. 177). As a surname, Kennedy is both Scottish and Irish. Kingswood (Perth & Kinross) but far more commonly found in England and also found in Ireland and Wales. No information has been found on the origin of the name of this St. Albert neighbourhood. Leger - there is a Legerwood in the Scottish Borders, the only occurrence of the name anywhere in the British Isles. This does not guarantee, of course, that the name of this neighbourhood is necessarily Scottish. On the contrary, it unlikely to be of Scottish origin since the neighbourhood commemorates long-serving politician Edmund Hugh Leger (1927-1990). Leger is an English or French family name. Lendrum Place (Lendrum and Lendrum Terrace in Aberdeenshire). The neighbourhood was named for the property once owned by Irish-born Robert Watt Lendrum, a government land surveyor. Judging by his name, Lendrum may well have been Scots-Irish. Lewis Farms (Lewis in the Outer Hebrides). Lewis is a Scottish family name, but it is also a common Welsh family name, and can be found as an element in place names in England and Ireland as well. The Edmonton locality was named for Calgary-born Ernie Lewis (1903-1987), an award-winning farmer and active school board member. (Naming Edmonton, 2004, p. 197). Lynnwood (Scottish Borders) also in Cumbria, England. According to Naming Edmonton (2004, p. 201), a "lynn" or "linn" refers to a linden or lime tree. It is possible that this could be a purely descriptive name. Mitchell Industrial - there is a Mitchell Hall in East Lothian, a Mitchell Hill in Dumfries & Galloway and the Scottish Borders, Mitchellhill in Aberdeenshire and Mitchellslacks in Dumfries & Galloway, but place names based on Mitchell are even more numerous throughout England, including Mitchell itself in Cornwall. The name Mitchell is found frequently enough in Scotland, however, for there to be a family tartan (illustrated here). The Edmonton neighbourhood was named for Frederick J. Mitchell (1893-1979), one of the city's longest serving aldermen. Mitchell was born in Ontario and came to Edmonton in 1916 (Naming Edmonton, 2004, p. 224). South Park (Dumfries & Galloway; also Aberdeenshire, spelt Southpark) but more common in England. This neighbourhood probably takes its name from South Park Drive, located in the southern half of the City of Leduc. Virginia Park (Virginia in the Orkney Islands) also in Ireland and on the Isle of Man. No information has been found on the origin of the name of this neighbourhood. It is possible, of course, that the reference might be to Virginia, USA, considering that several other Edmonton neighbourhoods once bore American names like Brooklyn, The Bronx and Manhattan Park. Walker - there are several places in Scotland based on the surname of Walker. The list includes Walkerburn (Scottish Borders), Walkerdales (Moray), Walkerdyke (South Lanarkshire), Walkerhill (Aberdeenshire and Dumfries & Galloway), Walkersknowe (Scottish Borders), Walkerstrough (Moray) and Walkerton (Fife). Walker is even more commonly found in England, including the town of Walker itself in the Tyneside area of northern England. The surname Walker is quite common in both Scotland (ranked 20th in a 1976 survey of family names) and in England (ranked 12th in a 1975 survey). No information has been found on the origin of the name of this new (post-2004) Edmonton neighbourhood. Waterton Estates (Aberdeenshire, East Ayrshire and Moray) also in the Vale of Glamorgan, Wales. White Industrial - White is both a Scottish and an English family name. The earliest record in Scotland is in 1097, the name being derived from the Old English word for white - 'hwit'. In Scotland, White and its variant Whyte are septs of Clan Lamont and Clan MacGregor. The Edmonton neighbourhood was named for Alberta-born Henry White (1907-1991), the first secretary of the City's Commission Board (Naming Edmonton, 2004, p. 338). Whitecroft, Whitecroft East and Whitecroft West - there is a place in Dumfries & Galloway called Whitecroft but this name is used far more frequently in southern England. Wilson Industrial - there are several places in Scotland based on the surname of Wilson (that's the Wilson family tartan shown here). The list includes Wilsonhall (Angus), Wilson Burn and Wilson's Pike (Scottish Borders), Wilson's Noup (Shetland Islands) and Wilsontown (South Lanarkshire). Wilson is even more commonly found in England, including the town of Wilson itself in Herefordshire and Leicestershire. The Scottish Wilsons are a sept of Clan Gunn and now have their own family tartan. The Edmonton neighbourhood honours Dr Herbert Charles Wilson, the first Speaker of the first North-West Territories Assembly in 1888 and Mayor of Edmonton from 1895 to 1896 (Naming Edmonton, 2004, pp. 344-345). Dr. H.C. Wilson (1859-1909) was born in Picton, Ontario. Woodcroft (Aberdeenshire; also Woodcraft farm in Dumfries & Galloway) but found more commonly in southern England. Edmonton toponymists consider the neighbourhood's name to be descriptive but its association with real estate tycoon J.R. McIntosh suggests the possibility of a Scottish connection. Woodland Downs - there is a Woodland in South Ayrshire as well as in five English counties. Woodland is also a fairly common name for neighbourhoods in American cities. The name of the Edmonton suburb in Strathcona County was probably made up to sound rustic and/or British. Woodlands (Aberdeenshire, Argyll & Bute, Borders, Dumfries & Galloway, Fife, Highland, Perth & Kinross, South Lanarkshire) also all over England and is found in Ireland and Wales as well. Youngstown Industrial and Britannia Youngstown - These neighbourhoods were probably named after Ira L. Young, the owner and developer of the property (Naming Edmonton, 2004, p. 352). Young is considered to be both a Scottish and an English family name, the two families bearing different coats of arms. Britannia is the Latin term for Britain (of which Scotland is a constituent part, together with England and Wales). A final category of neighbourhood and suburban names comprises places that can be found in Scotland but which, in Edmonton's case, definitely or most probably have no Scottish connection. Blackburne (Aberdeenshire, Scottish Borders, Dumfries & Galloway, Highland, Moray, South Lanarkshire and West Lothian - all spelt Blackburn) but found just as frequently in northern England, also spelt Blackburn. In the case of the Edmonton neighbourhood, the name appears to be a made-up one, based on Black Mud Creek and 'burne', the Old English word for a stream. Carleton Square Industrial - there is a Carleton, Carleton Croft and Carleton Port in Dumfries & Galloway, and a Carleton Bay, Carleton Fishering and Carleton Mains in South Ayrshire, but places with Carleton as an element in the name are more numerous in England, particularly in the north. Edmonton historians have put forward at least four theories on the origin of this neighbourhood's name, including the possibility that it may simply be a variation of Carlton. Any connection with Scotland seems unlikely. Carter Crest - there is a Carter Burn, Carter Fell, Carterhaugh, Carterhope Burn, Carterhope Rig and Carterhouse in the Scottish Borders; also Carterton and Carterton Knowes in Dumfries & Galloway. Carter is commonly found as an element in place names in northern England as well. The neighbourhood was actually named for an American, Robert L. Carter (1858-1931) who advised Americans wishing to settle in Canada. Dunluce - there is a Glenluce and Luce Bay in Dumfries & Galloway and "Dun" is frequently used in Scottish place names to signify a hill or hill fort. The Edmonton neighbourhood was actually named for Dunluce Castle in County Antrim, Northern Ireland. This castle was at one stage effectively 'Scottish property' since it was owned until 1928 by the McDonnells, "Lords of the Isles", who for many centuries were nominal vassals of the King of Norway and/or King of Scotland. Greenfield (City of Glasgow) also in England and Wales. The name of this neighbourhood honours Herbert Greenfield, the English-born Premier of Alberta from 1921 to 1925 and therefore has no connection with Scotland. This neighbourhood is also sometimes referred to as Petrolia, a name honouring the importance of the petrochemical industry in Alberta. Lambton Industrial - there is a village in the Scottish Highlands called Lambton. It is far more likely, however, that the name of this neighbourhood honours John George Lambton, the first Earl of Durham who served briefly as Governor-General of British North America in 1838. The Earl of Lambton's family seat is at Lambton, Sunderland, in northern England. Mayfield (Aberdeenshire, Dumfries & Galloway, East Ayrshire, City of Edinburgh, Fife, Highland, Midlothian, North Ayrshire, Orkney Islands, Perth & Kinross, Shetland Islands and South Lanarkshire). Mayfield is also found throughout England but less commonly than in Scotland. This Edmonton neighbourhood actually commemorates Wilfred "Wop" May (ancestry not reported), founder of the first civil aviation service in Edmonton. May is considered to be an English or German family name. Miller - there is a Millerhill in Midlothian plus numerous other places in Scotland with Miller as an element in the name, but this is also true in England. In the case of this neighbourhood, the connection is with neither Scotland nor England, but with Hungarian-born Abe William Miller (1897-1964), a lawyer, politician and volunteer. Newton - although there are numerous places in Scotland (as well as in England and Wales) called Newton, the Edmonton neighbourhood was actually named for an Englishman, Canon William Newton, an early Anglican minister. Summerlea -a place in North Lanarkshire is called Summerlee. However, the origin of the name of the Edmonton neighbourhood appears to have no connection with Scotland. The entry in Naming Edmonton (2004, p. 297) states that Summerlea was named for a summertime meadow and that the neighbourhood has a large area of parkland. The Grange (Angus, City of Edinburgh and Highland) but in Edmonton's case is far more likely to recall places in England since other neighbourhoods in the same area have English names. Wellington (Aberdeenshire; also Wellington House in Midlothian) but far more commonly found in England. It is more likely that the name of the Edmonton community commemorates Arthur Wellesley, the first Duke of Wellington, hero of the Battle of Waterloo. Westwood (Dumfries & Galloway, Highland, Perth & Kinross, Stirling and South Lanarkshire) but Westwood is also commonly found throughout England and is a favourite name for neighbourhoods in other Canadian and American cities. Like Eastwood to its east, the Edmonton neighbourhood of Westwood was most probably named for purely descriptive reasons. There is a long list of parks and sports grounds dotted around the City of Edmonton that sound distinctly Scottish. Examples include Angus Murray Park (Pleasantview), Beatrice Carmichael Park (Downtown), Dr Anne Anderson Park (Britannia), Dr Wilbert McIntyre Park (Strathcona), Duncan Innes Park (King Edward Park), Edinboro Park (Windsor Park), Gowan Park (McKernan), John G. Niddrie Park (Westmount), Louise McKinney Riverfront Park (Boyle Street) and McDougall Park (Downtown). This list is by no means exhaustive. Bridges include Campbell Bridge, Dudley B. Menzies Bridge, Groat Bridge, James MacDonald Bridge, MacKinnon Ravine Bridge and McKenzie Ravine Bridge. Scottish names are also frequently found as street and road names, though most of Edmonton's streets and avenues are numbered. A distinctly Scottish feature of the Edmonton streetscape is its numerous Wynds. For example, Bowen Wynd, Ormsby Wynd or Butterworth Wynd (Mary Butterworth was born in Scotland). Wynd is a Scots word for a narrow street or lane, which leads off a more important thoroughfare. Judging purely by the names of its communities, neighbourhoods, suburbs, roads, parks and bridges, Edmonton is one of the Canadian cities (along with Calgary, Halifax, Hamilton and Winnipeg) where Scottish influences appear to have been particularly marked. In many cases these influences were indirect since a large number of the place names commemorate early settlers from other parts of Canada whose ancestry was probably Scottish. Nevertheless, Edmonton's place names illustrate the far-reaching effects of the Scottish diaspora of the 18th, 19th and early 20th centuries. City of Edmonton (2004). Naming Edmonton: From Ada to Zoie (The University of Alberta Press, Edmonton). Edmonton, St Albert, Sherwood Park and Fort Saskatchewan Street Map, 2002 (MapArt Publishing, Edmonton). Merrily Aubrey, Geographical Names Program, Heritage Resource Management Branch, Alberta Community Development. Scarlett, James D. (1975). The Tartans of the Scottish Clans (Collins, Glasgow and London). Wikipedia article on Edmonton Neighbourhoods.